Once, humans and beasts coexisted peacefully in the magical world of Remnant. Now they are at fierce odds. When the people of Remnant aren’t fighting monsters, they still find conflict among themselves. Now they are at fierce odds. Ruby Rose, Weiss Schnee, Blake Belladonna and Yang Xiao Long are Team RWBY. Together they are learning the deadly craft of hunting the monstrous species known as the Grimm. From the acclaimed creator of Dogs: Bullets & Carnage, an action-packed prequel story to the global hit animation series from Rooster Teeth. Shirow Miwa debuted in UltraJump magazine in 1999 with the short series Black Mind. His next series, Dogs, published in the magazine from 2000 to 2001, instantly became a popular success. He returned in 2005 with Dogs: Bullets & Carnage, which is currently running in UltraJump. Miwa also creates illustrations for books, music videos and magazines, and produces doujinshi (independent comics) under the circle name m.m.m.WORKS. These stories, ranging from silly to serious, all star Yang, Ruby's fiercly loyal big sister with a stern but sensitive personality and tough-as-nails battle skills (with attitude to match)! From a team of exciting new manga artists comes the fourth volume in a series of short story collections showcasing Ruby, Weiss, Blake and Yang! Never miss a new release. 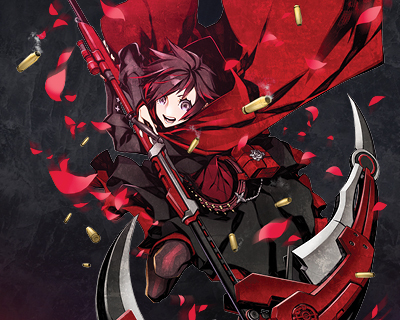 Follow RWBY today!